Don’t Have An Emergency Fund? Don’t Panic Yet. >> Don’t Have An Emergency Fund? Don’t Panic Yet. 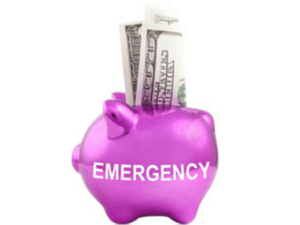 In financial discussions, a topic that we’re always hearing about is emergency funds. We’re all advised to have one in place, but how many of us actually do? Having an emergency fund is really important and a smart financial decision. Most financial planners suggest that an emergency fund contain enough money to cover at least three months of living expenses. If you don’t have an emergency fund, you should consider setting one up. If something comes up, you don’t want to have to dip into your savings account or charge to your credit card. Having said that, recommending that someone have an emergency fund once they need is not helpful at all. So what do you do when something does come up, and you have no emergency fund to speak of? This post of Grad Money Matters has some great ideas about different ways you can pay off an unexpected or a large expense when you’re not expecting it.